Seussical The Musical in rehearsal fo the big debut. Over the years, plays and musicals have become the new “big thing” here at Hamilton-Wenham. 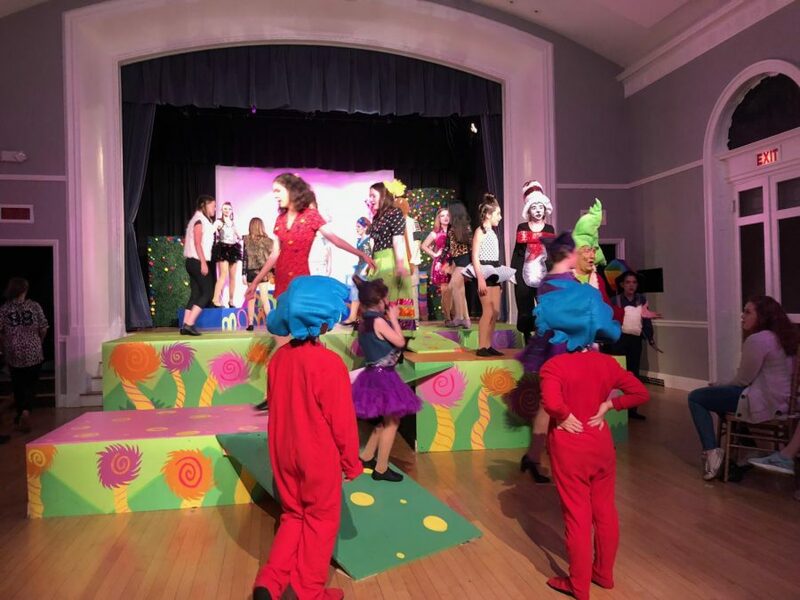 But it isn’t just school systems that put on these spectacular performances: big, local stage companies also take on the role.“I think Hamilton-Wenham is a hub for arts, and the community is very supportive of all arts,”says Katie Clarke, the managing director at Stage 284. Imagine entering the stage for the first show, the big debut. You are excited but also a little nervous, and you have butterflies forming in your stomach. When you finally get on the big stage, the bright lights shine down on you. Out in the audience, there is not an empty seat in sight. You feel delighted and filled with joy. Backstage, there are people running around, rehearsing lines, yelling cues, and putting their makeup and costumes on. These feelings can make you feel at home, as you are surrounded by the people that love you most and who you are happy to call your “second family.”At Stage 284, these feelings are never scarce. Spending hours a day with people of different ages and talents can really build new friendships that will last forever. This year marks the tenth anniversary of Stage 284’s partnership with the arts at the Community House. Katie Clarke has seen tremendous growth at Stage 284, which used to be called The Community House Theater. Not only has there been growth with the company, but also with the actors. “I love working with performers because they have so much to teach me. Every time I enter the rehearsal room I am challenged, inspired and entertained by our cast,” says Katie Clarke. Stage 284 is just one of the theater options in Hamilton-Wenham. At the middle school, students take the Drama elective for a quarter in sixth and eighth grades.The middle and high school both have fall musicals that end up becoming the schools’ “big production.” The schools also have One Acts, which are short plays written by the participating students, who then bring their masterpiece to the Drama Fest. Ms. DeLima says,“Experience doesn’t have to do with talent…they can discover an interest they didn’t know they had.” This is key for plays and musicals, especially in school systems because theater may not be for everyone. However, once you try it you could find how moving and significant it really is to you and other people. It is very hard to make time for everything in life, but if you find something you love to do, you make a commitment to do it because you know that it can lead to great things. It shows how much you really care. Theater will take you on a journey like never before, even if you are just watching it. You can experience the journey at any age and with any level of talent. Once you try theater you never know what you may discover, whether it is your singing voice or your acting ability. The high school just finished up with their production of Into The Woods. The middle school is currently working on their production of Peter Pan. Stage 284 just wrapped up Seussical The Musical and they are now casting people for To Kill a Mockingbird, which will have its debut in January. They will also be putting on the production of The Best Christmas Pageant Ever: The Musical on December 14-22.